There is no doubt that many will find Paul Thomas Anderson’s latest offering to be a somewhat befuddling and alienating experience, while others will no doubt embrace the madcap narrative, crazy characters and altogether strange goings-on that make Inherent Vice a truly unique motion picture. This is not a film that makes is necessarily easy for an audience to embrace. 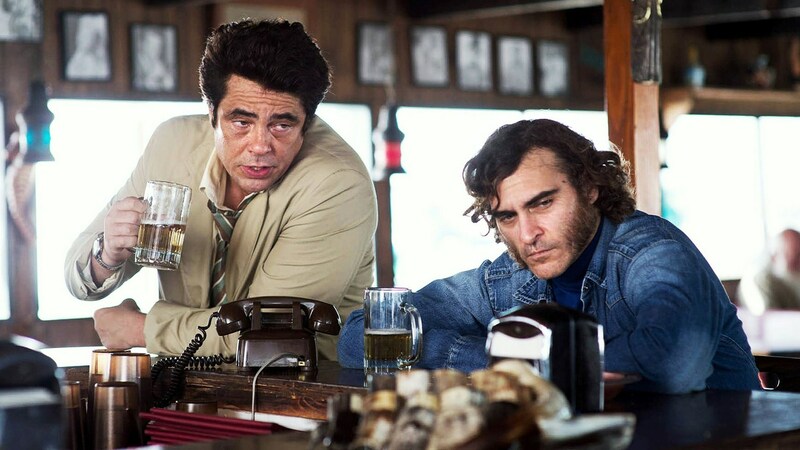 It is a confusing mélange of pot, paranoia, murder, mystery, heartbreak and humour in which Joaquin Phoenix – teaming with Anderson again following their collaboration on The Master – is mumbling, bumbling, mutton-chopped private detective Larry ‘Doc’ Sportello in Los Angeles in 1970. Anderson has never been afraid to dish up characters with off-kilter personalities, from John C Reilly’s lonely cop in Magnolia to Adam Sandler’s Barry Egan in Punch Drunk Love or even Phoenix’s turn as Freddie Quell in The Master, and Doc Sportello is another great addition to Anderson’s gallery of misfits. Adapted by Anderson from the novel of the same name by Thomas Pynchon, Inherent Vice is a private eye film that starts off conventionally enough before veering off to become something utterly unique. Proceedings get underway just as almost every other classic private eye story does; an alluring female slinks her way into the orbit of the disheveled investigator and uses her feminine wiles to send our hero on a mission that is always much more complex than if first seems. In this instance, the femme in question is Sportellos’ ex-girlfriend Shasta Fay Hepworth (Katherine Waterston), the woman for whom he still pines and whose cry for help he is unable to resist. You see, Shasta’s new squeeze is real estate bigwig Michael Wolfmann (Eric Roberts), whose wife intends to have him abducted and committed to a mental institution. A simple mission to foil the abduction becomes much more complicated due to Sportello’s perpetually stoned state and the myriad obstacles that he encounters along the way, not the least of which is vindictive LAPD Detective Christian ‘Bigfoot’ Bjornsen (Josh Brolin). Anderson is no stranger to the melding the serious with the comic (Boogie Nights, Magnolia) and he does it again here with a deadpan riff on the last vestiges of the counter-culture movement and the transformation of LA into ubiquitous suburban sprawl; neighbourhoods being levelled to make way for new housing developments and the likes of Sportello regarded as burnt out relics of the past. A litany of characters flitter in and out of the narrative, including a District Attorney (Reese Witherspoon) who finds Sportello both infuriating and irresistible. There is also Jena Malone as a woman who recruits Sportello to locate her missing husband (Owen Wilson), Benicio Del Toro as a solicitor, Martin Short as a dentist who may, or may not, be the head of an international drug cartel and Maya Rudolph as a receptionist at the medical centre from which Sportello runs his business. However, it is Hong Chau who steals the supporting limelight as the hilariously straight talking prostitute Jade. The plot becomes increasingly chaotic and elusive as the story progresses, relying heavily on coincidence and happenstance to progress the action. The cinematography and production design effectively evoke the mood of the time and the score by Jonny Greenwood ensures the film sounds every bit as kooky and colourful as it looks. Throw in Joanna Newsom as the unreliable narrator Sortilege, a prophetess of sorts whose voice-over includes, apparently, passages taken directly from Pynchon’s novel, and you have something that defies any attempt at pigeonholing. Inherent Vice is a hodgepodge of influences and ideas that have been thrown together to create a film that is as exasperating as it is exhilarating in its sheer differentness. It takes a lot of skill to make something look this messy. Although decidedly lacking in coherence for much of the time, with Phoenix in fine fettle as the addled gumshoe, there is plenty of pleasure to be found. It is certainly not Anderson’s best work, but it is pretty darn good nevertheless.